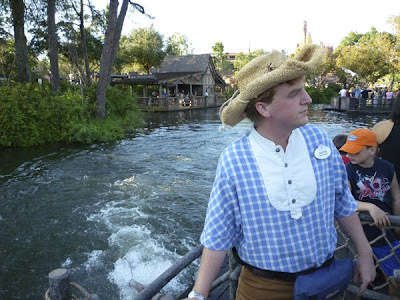 We were recently in Orlando doing some research for a potential upcoming project when we made this discovery. 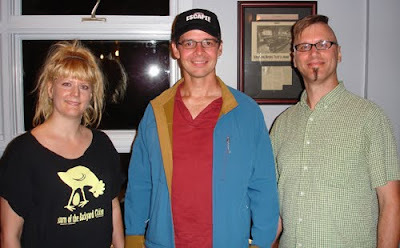 Mad City Chickens Screens in Kingston, Ontario Tonight! November 19th, Kingston, Ontario Canada - Public Screening presented by Urban Agriculture Kingston - 7:00pm Ellis Auditorium, 58 University Ave.
We're in Gainesville for Screening Tonight! Mad City Chickens screened at 7:00 pm tonight at the Civic Media Center, 433 S. Main Street, Gainesville, Florida. Around 40 people attended and gave us a warm southern welcome. The current ordinance on poultry-keeping in Gainesville is a little fuzzy with the best guess being a legal limit of 2 chickens. Locals hope to get the law re-written to clearly state the legality of backyard hens and to increase the number of birds allowed. 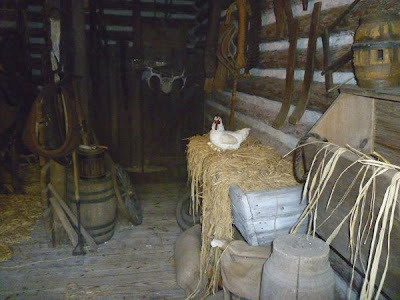 A lively and lengthy chicken dialogue followed the film with the sharing of lots of chicken advice and stories. 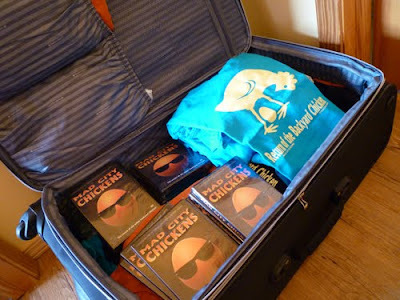 Packing the chicken swag bag. Selling merchandise helps fund future Tarazod movie projects. The final preparations are being made for our upcoming trip to Gainesville where on Saturday November 14th we'll be holding the Florida premiere of Mad City Chickens. The 7:00 pm screening will take place at the Civic Media Center, 433 S. Main Street in Gainesville. 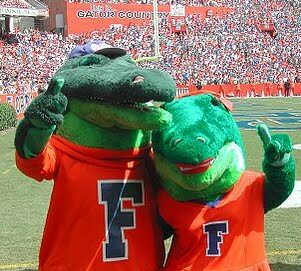 Hoping to see some Gators at our screening! 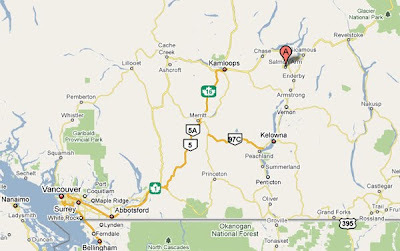 Salmon Arm, British Columbia is a small community located about 200 miles (320 kilometers) northeast of Vancouver. 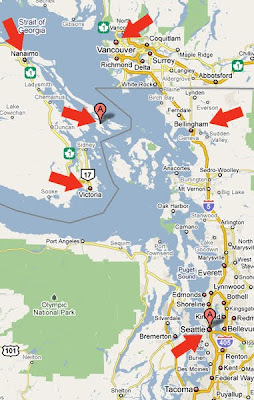 Canadians from coast to coast are letting it be known that they want their chickens within the city, and citizens in Salmon Arm are no different. 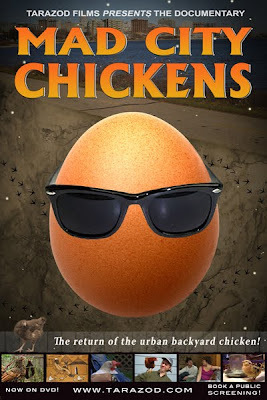 Tonight the Committee for a Strong, Sustainable Salmon Arm is sponsoring a public screening of Mad City Chickens - 7:00pm CASSSA office, 351 Hudson Ave. 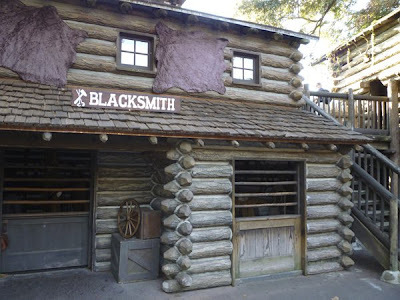 The little village of Blanchardville, Wisconsin has a population of only 800 or so, but last night's screening there was a pleasure to experience. 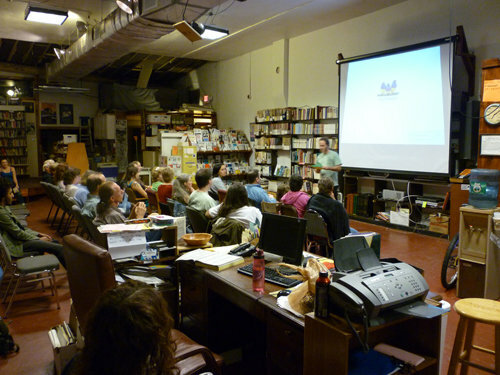 About 30 people filled the cozy backroom of the River Valley Trading Company where they watched Mad City Chickens. A lively and lovely Q&A followed with talk about chickens, goats and future Tarazod projects. ~November 7th, 2009 Bellingham, Washington USA - Public Screening presented by Pickford Film Center - 12:00pm Pickford Cinema, 1416 Cornwall Ave.
Mad City Chickens screens tonight in St. Louis! 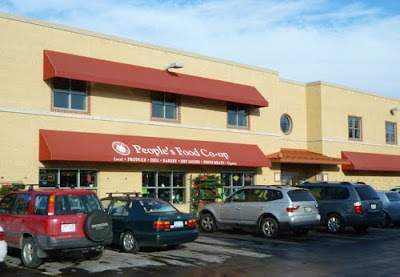 Public screening presented by Slow Food St. Louis - 6:00pm Schlafly Bottleworks, 7260 Southwest Ave. Followed by urban chicken Q&A with animal husbandry expert Merryl Winstein and local urban farmers Justin and Danielle Leszcz of Yellow Tree Farm. Public screening October 27th Honokaa, Hawaii - Presented by The Hilo Hamakua Community Development Corporation and Hawaii County Department of Research and Development as part of the class "A Pastured Poultry Model That Works". 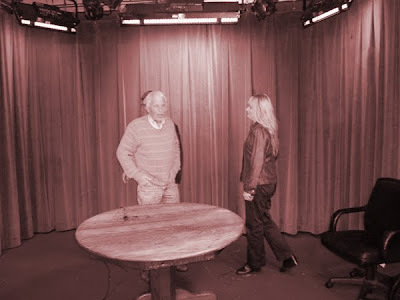 The New Yorker writer Susan Orlean and one of the founders of the Mad City Chickens group Dennis Harrison-Noonan (who is also in our film) both appeared on Wisconsin Public Radio yesterday to talk backyard chickens. Vancouver, British Columbia - Stone Soup Food Film Festival presented by Grandview Woodlands Food Connection and East End Food Co-op - 11:00am Britannia Community Centre, 1661 Napier St.
Bellingham, Washington - Doctober Film Festival presented by Pickford Film Center - 2:00pm Pickford Cinema, 1416 Cornwall Ave. Yesterday, we were featured with several other urban chicken keepers on Chicago Tonight, a news program on PBS affiliate WTTW! 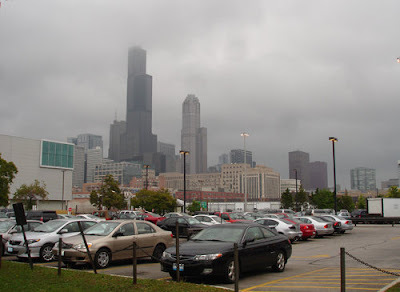 Host Rich Samuels interviewed a number of legal poultry owners in the Windy City and one not-so-legal (in Evanston). Rich also included the piece he did with us here in Madison as well as some key clips from the film. 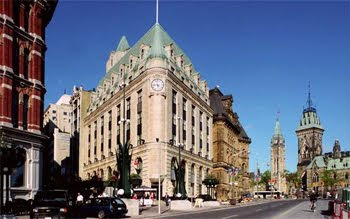 October 14th, 2009 Ottawa, Ontario Canada - World Food Day Screening presented by Just Food - 7:00pm (doors open 6:30) Saint Paul's University, Auditorium, 223 Main Street, Public consultation / policy discussion after the film. We had the pleasure of meeting and being interviewed today by Rich Samuels, long-time host of the PBS program Chicago Tonight on WTTW. 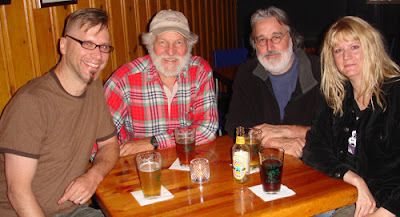 Rich came to Madison to ask us a few questions on tape about our chicken film and the whole backyard poultry movement. 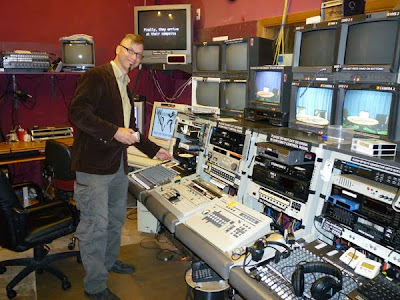 The interview was shot in the WYOU Studio in downtown Madison. Mad City Chickens screens in Seattle October 10th! Seattleites are right there on the cutting edge when it comes to urban sustainability, and backyard poultry are becoming more and more an integral part in this growing movement. 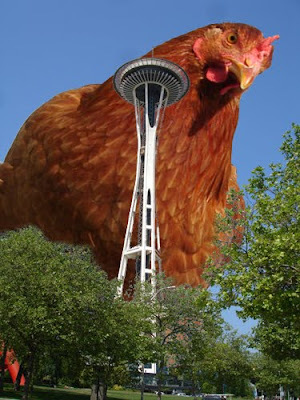 Last June, Mad City Chickens enjoyed two sold out screenings in the Emerald City. Now, the Queen Anne Movie Guild is bringing the film back for another public screening on October 10th at 7:00pm, Queen Anne United Methodist Church, 1606 5th Ave, Seattle. ~October 10th, 2009 Seattle - Public Screening presented by Queen Anne Movie Guild - 7:00pm Queen Anne United Methodist Church, 1606 5th Ave.
~October 17th, 2009 Bellingham - Doctober Film Festival presented by Pickford Film Center - 2:00pm Pickford Cinema, 1416 Cornwall Ave.
Tashai designed a new postcard (based on the original movie poster and DVD cover) to be sent out to help promote the Mad City Chickens film in areas that have not yet heard of it. 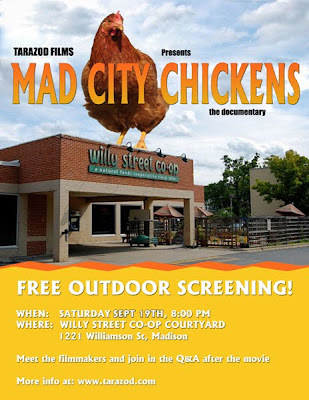 About 50 people showed up last weekend (sept 19th) to see Mad City Chickens in the front courtyard at the Willy Street Co-op in Madison. 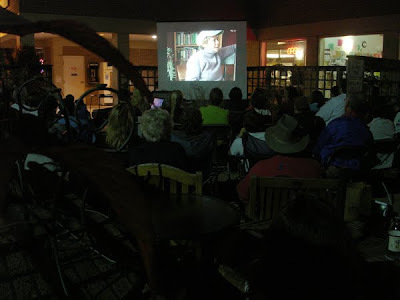 Outdoor screenings are always great fun! And the weather was just superb! 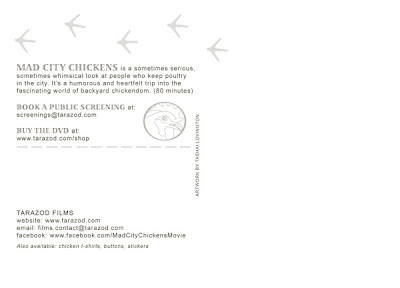 Reporter Ali Elkin attended our recent screening of Mad City Chickens in Evanston, Illinois where she got to experience firsthand the enthusiasm of a crowd of people who really want their chickens. Evanston currently prohibits the keeping of backyard poultry, but the tide is turning. 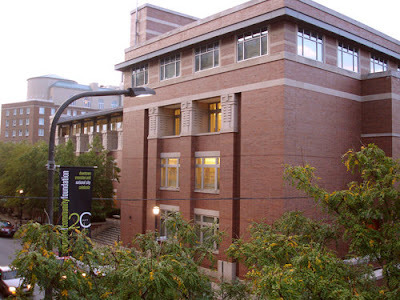 View the Daily Northwestern article. 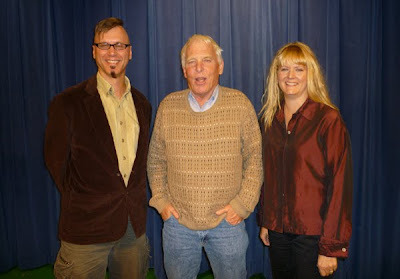 At last night's screening of Mad City Chickens in Chicago's Logan Square, we had a wonderful Q&A session. People from the neighborhood were able to network and talk urban sustainability. We're seeing more and more people coming together to form egg co-ops--one homeowner houses the hens, but a number of others assist in the upkeep and all share in the bounty. 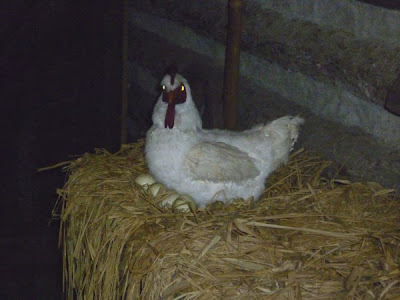 This is especially helpful for apartment dwellers with anti-poultry landlords. First stop on the Chicago tour: Hull House Museum on the campus of the University of Illinois. We talked chicken and showed 10 minutes of film clips to about 60 people who packed the room during their weekly "Rethinking Soup" gathering. 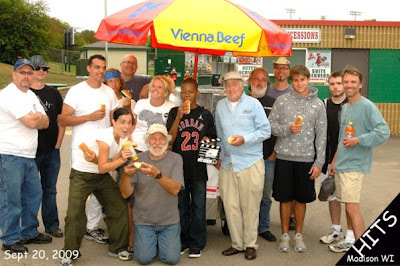 The mustard movie, Hits, wrapped on Sunday evening. Just loads of fun! Smart director, good script and great people. What a crew! Filmmaking is our drug!!! Here's the faux mustard label Tashai designed for the mustard movie, Hits, that is being shot this weekend. It's stars Colin Cameron (that's his face on the label). He played the mad professor in our Mad City Chickens film. Mad City Chickens is playing in the Chicago-area on this coming Tuesday and Wednesday. -September 22nd, 7:00pm, Armitage Baptisit Church, 2541 N. Kedzie in Chicago (enter on Albany St.). -September 23rd, 7:30pm, Evanston Public Library, 1703 Orrington Ave in Evanston. Filmmakers are scheduled to attend both screenings plus a special lunchtime chicken discussion at the University of Illinois (Chicago), September, 22, noon-1:00pm, UIC Hull House Museum, 800 S Halsted St.
Sponsors include Angelic Organics Learning Center, Evanston Public Library, Evanston Food Policy Council, Reeltime Film and Video Forum, Armitage Baptist Church, Earth First Farms, and Hull-House Museum at UIC. The Angry Filmmaker, Kelley Baker, is in town from Portland directing the mustard movie, Hits--a narrative being produced for the Mustard Museum. Producer on the film is Wisconsin Film School Director Jim Carrier; Robert is taking the DP role, and Tashai's whipping up some cool graphics for the shoot. Feast on This - A film festival celebrating farms, local food and community. 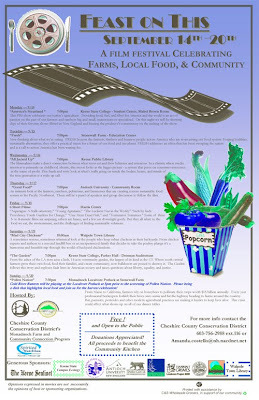 A week long event, September 14th - 20th, featuring 8 different films in communities throughout the state of New Hampshire. 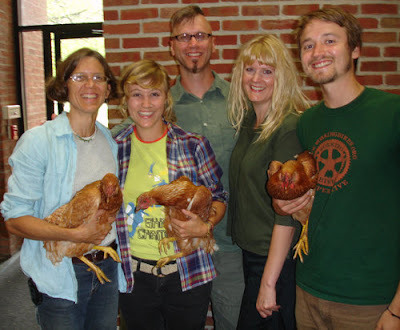 Mad City Chickens plays in Walpole 10:00am September 19th at the Walpole Public Library. 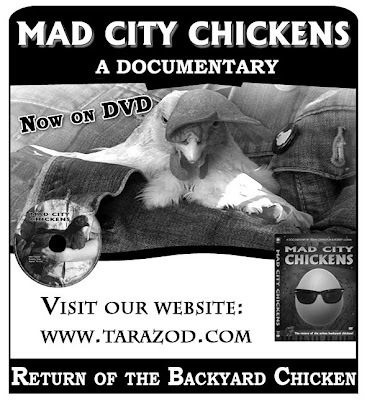 We've updated our Mad City Chickens press kit. Info on the film, synopses, high-res production stills, movie poster, director bios, and more. 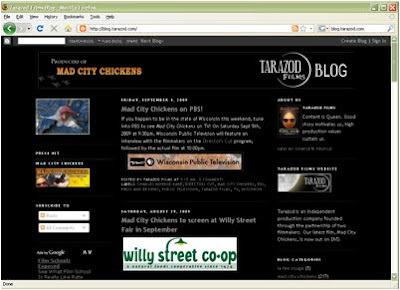 Welcome to the newly completed redesign of the Tarazod Films blog. 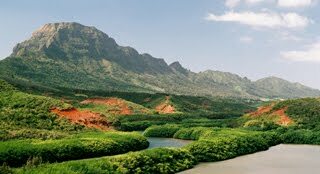 We think it's more aesthetically pleasing than our old version as well as more functional and streamlined for us to post to. 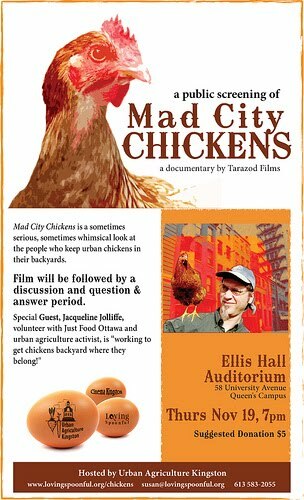 If you happen to be in the state of Wisconsin this weekend, tune into PBS to see Mad City Chickens on TV! 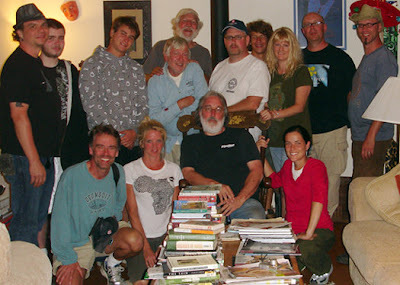 On Saturday Sept 5th, 2009 at 9:30pm, Wisconsin Public Television will feature an interview with the filmmakers on the Director's Cut, followed by the actual film at 10:00pm. 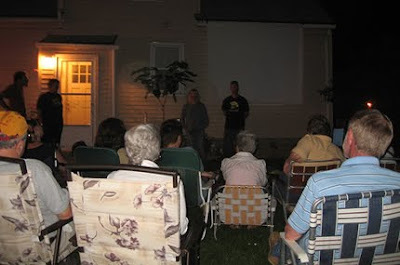 September 19th 2009 Madison, Wisconsin - Outdoor Film Series presented by the Willy Street Co-op - 8:00pm at the co-op, 1221 Williamson Street. The screening takes place during the Willy Street Fair. The filmmakers are scheduled to attend and will do a Q&A afterward. What a delight to be greeted by over 200 enthusiastic chicken lovers! They came to view Mad City Chickens, and then talk about chickens. Katherine Anderson, local farmer who raises chickens and turkeys, and Loren Luyendyk, a carpenter who builds chicken coops, also answered questions. The Santa Barbara Library’s Faulkner Gallery is a beautiful room. People squeezed in, some sitting on the floor. They were all good humored and eager to get help with their chicken questions and willing to help others. I’ve seen the movie several times now. It’s a Feel Good movie as well as documenting the backyard chicken situation and the legal particulars of Madison, Wisconsin. Watching it with an appreciative audience makes it all the more enjoyable. Tonight's public screening will be a Santa Barbara premiere. Sponsored by Hope Dance Films, the show will begin at 7:00pm at the Faulkner Gallery, Santa Barbara Public Library, 40 E. Anapamu Street. Chicken author Christine Heinrichs, who's also in the film, is scheduled to do a Q&A after the screening. 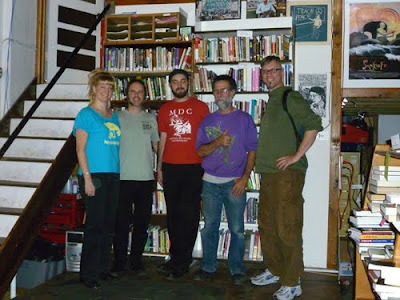 Muchas gracias to Kristy for posting images of all the coops from Saturday's Madison Chicken Coop Tour on her flickr account.